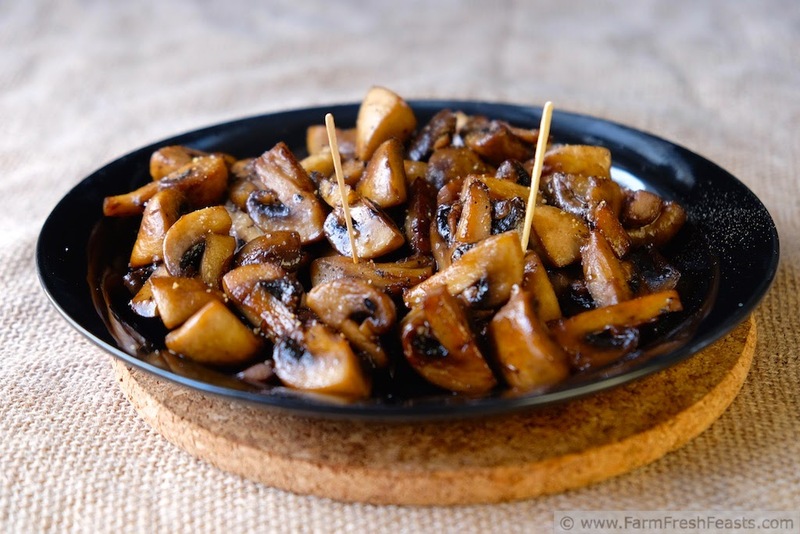 Teriyaki sauce tossed with roasted mushrooms for an easy to fix savory appetizer. It's been over a week since our Fall Community Supported Agriculture (CSA) farm share ended. One moment I'm blogging my Thanksgiving After Action Report, the next moment I'm cleaning up from Robert Barker's latest escapade [he chewed a hole in my nukable neck wrap and I vacuumed rice & flax seed from the living room rug. Now there are piles of rice & flax seed all around the yard]. You can read about Robert's story--and get a dog food recipe--here. The end of the Fall CSA means two things: time for mushrooms and time to squeeze in all my end-of-year posts before I take a holiday break. No, it doesn't mean I'll stop blogging about what we're eating from the farm share. Although we only get fresh foods from the farm for about 6 months of the year, to paraphrase the words of my birthday t-shirt, "We eat local because I CAN" (seriously cute shirts, no affiliation to disclose). The point is that I've been freezing and canning and filling up the Strategic Winter Squash Reserve like a boss an ant all Fall, and after I take a couple of weeks off to host my family-of-origin (flung from the far corners of the globe to Southwestern Ohio for the holidays) I'll be back on it with seasonal CSA-inspired recipes, ways to use local foods, and the occasional indulgence thrice weekly in 2015. Mushrooms and end of year posts . . . there's a connection. We don't get mushrooms in the farm share, though if I'm lucky I can score an occasional King Oyster mushroom at the farmer's market--so I like to make mushroom treats for my spouse and I while I'm not staring at overwhelming piles of mustard greens. I'm also participating in Holiday Baking Week next week, sharing five sweet holiday recipes [though predominantly getting my ethnic on] with giveaways for you folks. That means I need to get my savory and New Year's recipes up now, like this little effort-big taste vegetable appetizer, one of my Awesome Veggie Apps and Snacks (link to my Pinterest board). 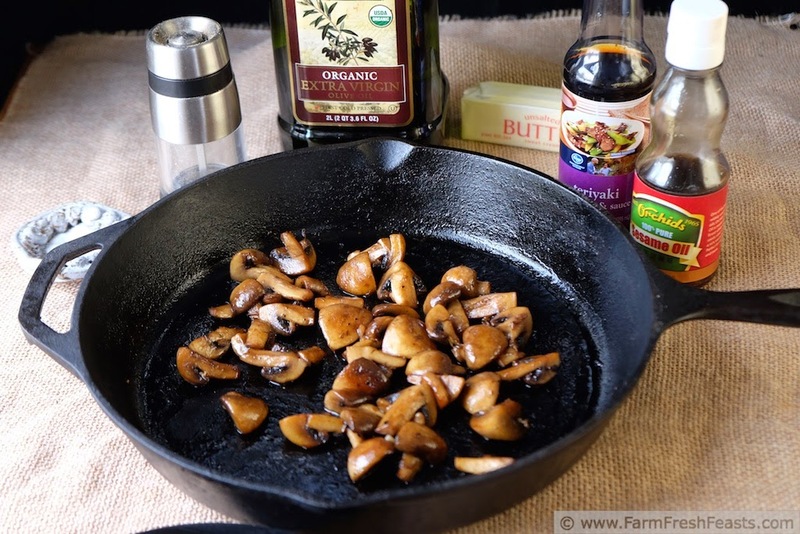 My spouse and I consider a skillet of mushrooms a mini-date--we're easy to please--and I've shared several recipes. You can find more mushroom recipes in my Mushroom Recipe Collection, part of my Visual Recipe Index. Preheat the oven to 425 degrees Fahrenheit. 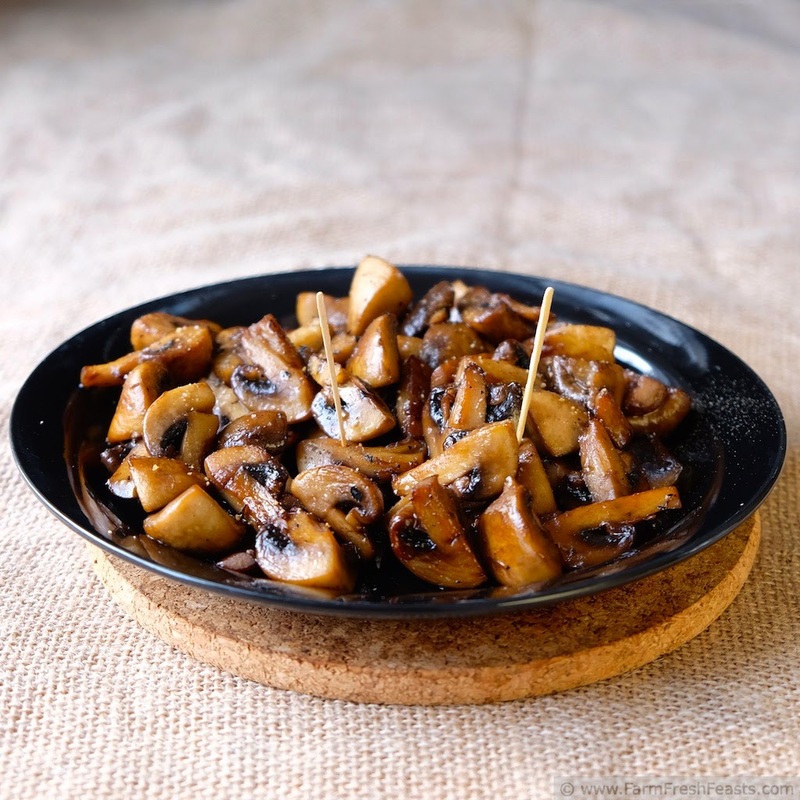 In a large bowl, toss washed mushrooms with butter and olive oil. Spread onto a rimmed baking sheet, and bake for 30 minutes, stirring every 10 minutes, until mushrooms are browned at the edges and have given up their liquid. Return to bowl and season with salt and pepper, then toss with teriyaki sauce and sesame oil. Taste and see if you need a bit more salt or pepper. Serve warm or at room temperature. I need to try these soon! They sound wonderful! Thanks for linking up with What's Cookin' Wednesday! This are part of tonight's Valentine's meal for my spouse and I--I'm going to try them with shiitake mushrooms! 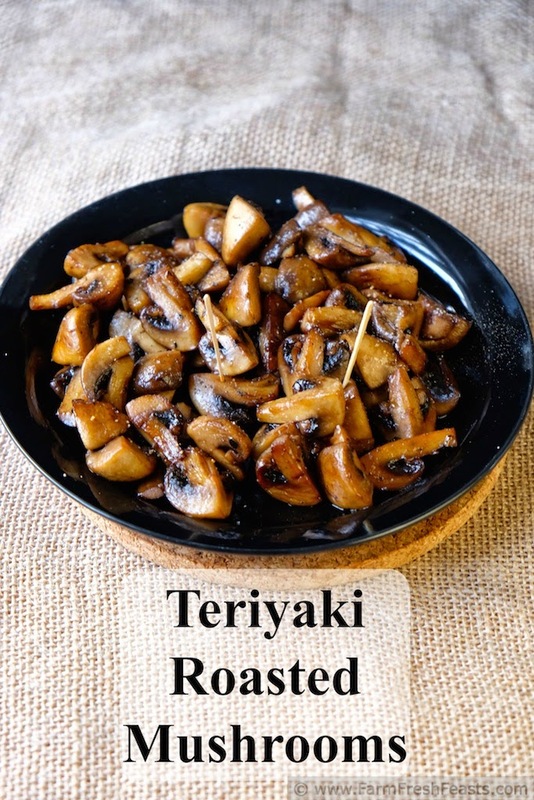 I make this only with baby bella mushrooms- halved and tossed in olive oil. Put them on baking sheet, and dump a bit of teriayaki sauce on top before baking with the same instructions above.